American manned spacecraft. Study 2012. Raytheon's CEV was a low L/D capsule, designed for three crew, sized so that an existing EELV Heavy could send it towards L1. Status: Study 2012. Gross mass: 7,132 kg (15,723 lb). Unfuelled mass: 4,282 kg (9,440 lb). Specific impulse: 320 s. Height: 6.50 m (21.30 ft). Diameter: 4.00 m (13.10 ft). Total mass of the CEV would be 7132 kg, split between the Crew Module (CM) re-entry vehicle (3726 kg) and the PM propulsion module (556 kg empty, 3406 kg loaded with storable propellants and using existing, proven, reliable reaction control and OMS engines developed for the space shuttle. The CEV had sufficient propellants to maneuver into a halo orbit at the L1 staging point, and then brake from there to a re-entry into the earth's atmosphere. 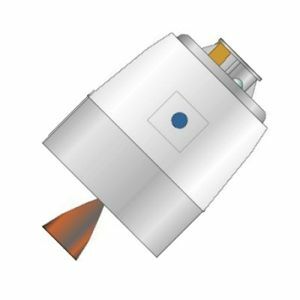 The CEV, together with supplemental payload, would be within the 9600 kg payload capability of a heavy-lift EELV (Delta IV) on a trans-L1 trajectory. For ISS resupply missions, this delta-V would not be required and could be traded off for payload. Raytheon advocated a three-member crew, to provide the minimum operational and safety margins, while otherwise minimizing cost. Raytheon's analysis showed that the CEV mass had to kept under 9 metric tons to eliminate the need for rendezvous and docking operations in low earth orbit. The L1 staging area took care of this problem, allowing the CEV and other payload elements to be launched directly toward L1. Here a single, always available, dynamically stable area could be used for lunar spacecraft assembly and refueling operations. By comparison NASA's plans to use both earth-orbit and lunar-orbit rendezvous required complex operations with limited launch and rendezvous opportunities at two different areas. Raytheon's lunar lander, and later lunar bases could be established using only existing EELV commercial vehicles. The only requirement would be man-rating an existing EELV. The L1 scenario would allow bases to be established anywhere on the lunar surface, and 14 sites of interest were identified. However Raytheon's preferred lunar exploration scenario was an initial base at the South Pole. Base elements would be covered with lunar regolith for thermal, meteoroid, and radiation shielding. In addition to the CEV, Raytheon identified the following spacecraft as necessary for lunar exploration. They would be assembled at L1, refueled at first by propellant delivered from the earth, later by propellant mined from the moon. Lunar Exploration Vehicle (LEV), consisting of a reusable single-stage propulsion module with landing gear supports. The version used at first would use proven storable hypergolic propellants with a specific impulse of 320 sec. Only after ISRU propellant production had begun on the moon or Mars, would a different-model lander using cryogenic LOX/LH2 or LOX/CH4 propellants would be introduced. The LEV would transport 3 crew from the L-1 staging point to the lunar surface and back, having a delta-V of 5200 m/s for this purpose. It would be reusable, with a 15 mission life. 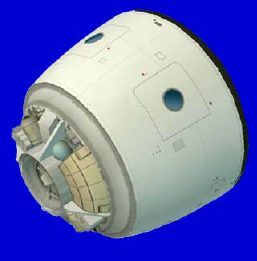 The crew module (CM) subsystems would be derived from those of the CEV. The LEV would have a fueled mass of 29,225 kg and an empty mass of 5532 kg. Just under half of this would be the CM, the rest the propulsion stage and landing gear. Lunar Cargo Lander, sized for direct launch to the moon by an EELV. It would deliver 2500 kg of cargo directly on the lunar surface. Later versions would use ISRU propellants, be refueled at L1, and have payloads of 4500 kg, then 8500 kg on the lunar surface. Launch mass would be 9400 kg, with 4900 kg of liquid oxygen/hydrogen propellants providing a delta-V of 2300 m/s. Propellant Delivery Carrier, sized for direct launch toward L1. It would deliver 7 metric tons of storable propellants to L1, where they would be used to top up the tanks of the LEV lander. The spacecraft would have a launch mass of 9600 kg. Dry mass would be 1763 kg, and 880 kg of the propellants loaded would be used by on-board rocket engines to insert the tanker at L1. Solar Power Station, which would be launched directly toward the moon and landed by the cargo lander. It would have a landed mass of 6900 kg, including a 2000 kg power package. The station would supply power to the previously-landed habitat and allow crew stays of up to 120 days or more. The station would be equipped with a single tracking solar panel of 20 m2, providing 4 kW of power to 50 kWh batteries. Open Rover, similar to those used on Apollo missions. It would be 3 m long, 2.3 m wheelbase, 220 kg mass, maximum speed of 3.5 m/s. Its four-wheel drive would allow traverses of tens of kilometers from the base site. Regolith handlers, robotic regolith handlers and a sintering machine. These would have a mass of under 1200 kg each, and would be used to cover the habitat for radiation shielding, make the base area dust-free by sintering the surface, and conduct initial tests on propellant generation. Crew Size: 3. Habitable Volume: 15.00 m3. Spacecraft delta v: 1,600 m/s (5,200 ft/sec). Electric System: 2.50 kWh. Family: Lunar Bases, Manned spacecraft, Moon. Country: USA. Propellants: N2O4/MMH. Agency: NASA, Raytheon.